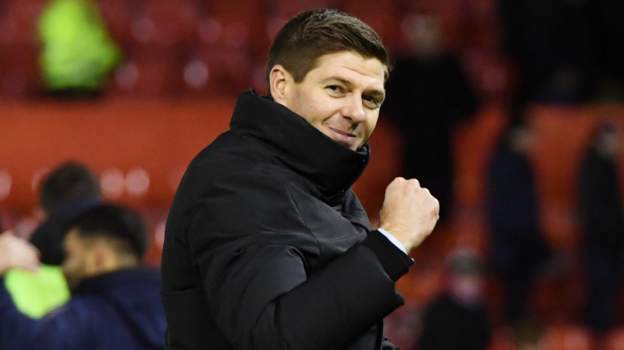 Steven Gerrard last night dropped a big hint that despite the win over Aberdeen using the more popular 4-2-3-1 formation, he may revert to diamond again against Kilmarnock at the weekend despite that formation’s clear inadequacy. Speaking after the match, Gerrard appeared unsure on his best team or formation to face Steve Clarke’s side on Saturday, and admitted that is a decision yet to be taken. We must admit some slight confusion – despite the poor performances via the diamond, and the clear superiority of the 4-2-3-1, Gerrard seems a lot less sure about which formation he actually prefers. True, it’s a different competition, and sometimes different systems can be deployed, but not usually at this stage and not usually against a side of the quality of Kilmarnock especially given how badly the diamond failed last time out at Rugby Park. Of course there’s also the 4-3-3 but that formation appears to be getting used a lot less these days, so if Gerrard isn’t content with 4-2-3-1 for now, we do wonder just why not. Any Rangers minded person that buys any of those stinking rags should take a right good look at themselves. First sign it's not working, we should switch. Seems unlikely. With Morelos out the only two strikers we have are Defoe and Lafferty and that wasn't exactly a big success against Cowdenbeath. Ultimately it may not matter what formation we play. We struggled in the last Killie game because they pushed their wide players Burke and a Jones onto our full backs to stop them getting forward leaving our centre backs on the ball. Unless we can find a solution to that then we will struggle again.